Point and control. That’s the basis of the SevenHugs Smart Remote. Instead of selecting, say, a connected light bulb on a menu in the remote, a user simply points the remote at the light to control it. Want to control a Sonos speaker? Point the remote at the speakers and the remote knows to control the device. SevenHugs calls it a contextual remote control and it has the potential to radically change how devices are controlled in the home. The company is today exhibiting a working prototype of the Smart Remote at TechCrunch Disrupt London along with releasing an APK and API to build developer support prior to its launch in 2016. The company is based out of Paris and secured a €1.5 seed-funding round in March of 2015. The SmartRemote is SmartHugs’ second product. The company announced the hugOne family sleep monitor earlier this year and it plans to ship it to Europe and the US by the end of 2015. With the Smart Remote, SevenHugs is attempting to consolidate control of smart home appliances. Right now, users often have to use separate smartphone apps to control connected lightbulbs, speakers and other Internet of Things devices. Dedicated remotes from companies like Logitech, Savant and others offer consolidation solutions, but they’re often expensive and confusing to use. The Smart Remote seems easy enough. 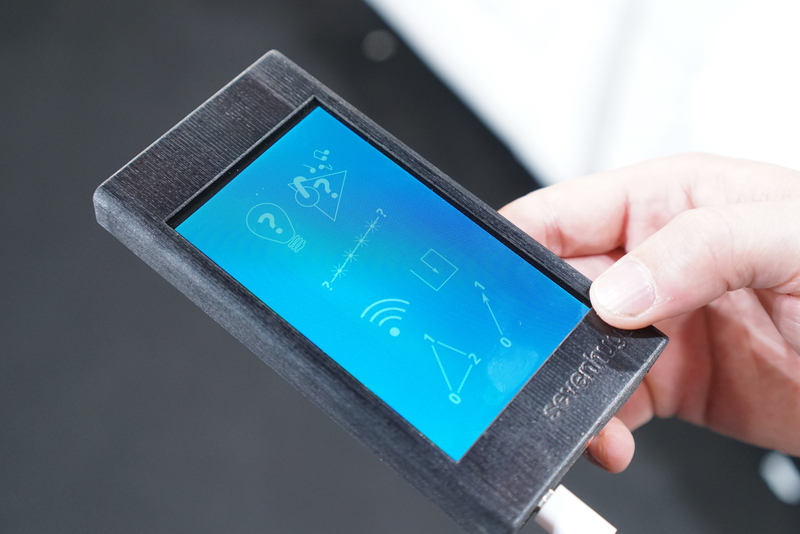 Users point the device towards a connected device to control it using Wifi. The remote automatically recognizes the device and changes its screen to displays the control scheme for the device. At launch, the company plans to ship three lamp socket modules to enable functionality out of the box. These lamp socket modules are key to the whole operation. All three must be used as they provide location data for the remote. It’s best if the three lamp modules are located in the same room. The remote can control these modules out of the box. To set up a Sonos or Hue light, the user holds the remote next to the light and tells the remote to remember the location. Then, using the location data provided by the three lamp modules, the remote knows the exact location of the device. Right now the Smart Remote works with the lamp socket modules, Hue lights and Sonos speakers. It will soon work with Nest Thermostats. SevenHugs has yet to set a price for the Smart Remote. It expects to launch a Kickstarter campaign in February 2016 and ship the product later in the year.